Defining the term “Equilibration”: the achievement of a balance between opposing elements or forces. the act or acts done to put the mandible into equilibrium with the maxilla. a condition in which all the forces acting upon the mandible are neutralized. n the modification of occlusal forms of teeth by grinding, with the intent of equalizing occlusal stress and of harmonizing cuspal relations in function. TM joint condyles disc displacement problems that can also contribute to muscular pain problems). All TMD patients should definitely be cautious on having any procedure the would permanently alter the bite of the teeth and occlusion. Until these aforementioned structural factors have been determined balanced and ‘normal’, it would be prudent to reconsider having any teeth “equilibrated” or adjusted which could contribute to a reposition of the jaws and or changes in vertical dimension of the bite. 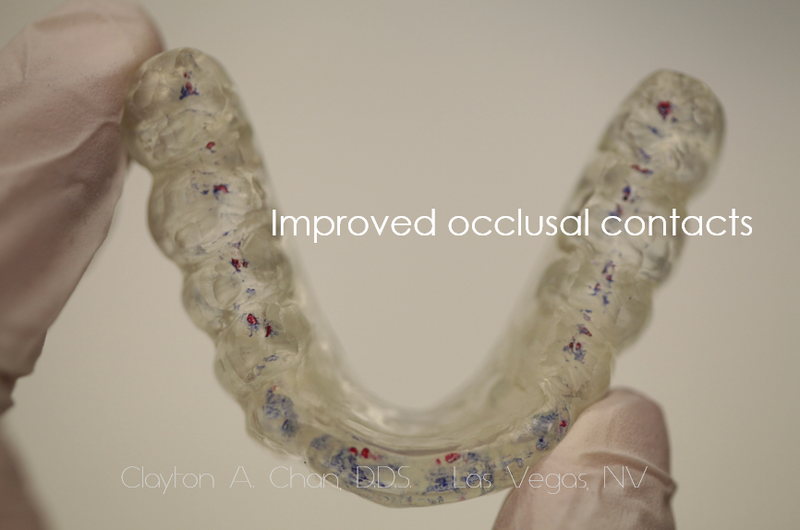 A conservative removable orthotic has been proven to be effective phase I stabilizing treatment when the dentist has been properly trained and skilled in micro-occlusal adjustment protocols. It would be unfortunate to attempt to correct a muscular problem via occlusal alteration (equilbration) on natural dentition when these other factors could be underlying contributors to muscular issues. Muscles don’t strain and pain unless there is underlying bone displacements, joint derangement and postural imbalances, eventually over time it can effect the teeth. Attempting to occlusally adjust the bite (reshaping enamel) may be a simple straight forward way to address a muscle problem if and only if the muscles are straining because of some recent occlusal restorative treatment that was done (high filling or high crown as examples). In that case have the dentist correct and adjust that single tooth, but not the whole arch and muscular issue most likely will go away if one does not have prior muscular pain. Dentist now a days want to try out their fancy EMG bite occlusal equipment and start adjust folks bites not always recognizing the problems mentioned above. Patients who have musculoskeletal occlusal signs and symptoms should seriously consider working with a trained and skilled dentist who understands how to properly manage a removable GNM orthotic when treating pain, masticatory dysfunction and joint derangement problems. 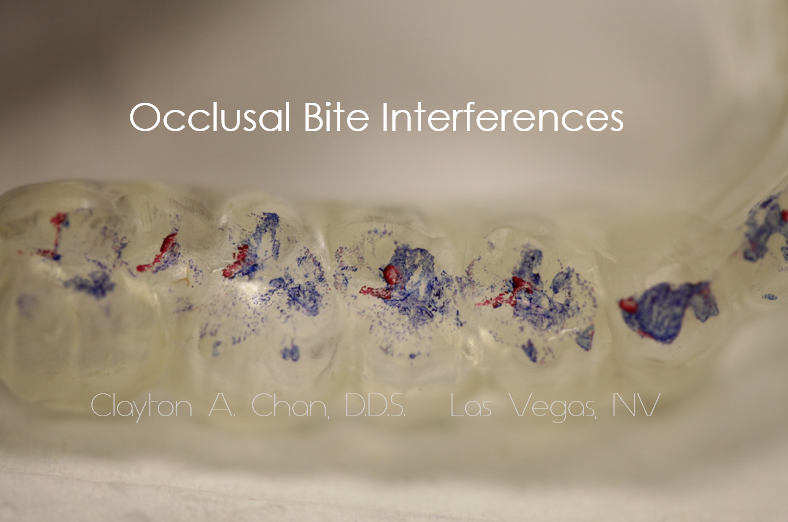 Fine and detailed “Micro occlusal” management details are important when a TMD patient is able to feel and sense 15-17 microns of a single strand of hair thickness between their teeth. A trained dentist who understands the importance and value of using low frequency J5 myomonitor TENS in conjunction with accurately locating one’s jaw and joint position as they related to calming spastic musculature and uses principles of both gnathologic as well as neuromuscular principles (GNM) is better suited to deal with those often and hidden occlusal muscular joint problems. one may suspect that your bite/occlusion can be a improperly diagnosed. If your muscular pain is not resolving, then it would be prudent to reconsider alternative methods or treatments prior to proceeding forward into a phase 2 orthodontic or restorative stage of treatment. Please consult your dentist to find out why your muscular problems are not resolving. There are answers to this combination of problems! According to GNM occlusal adjustment protocols these issues most likely are related to your bite and occlusal prematurities that are triggering and contributing to these areas of pain and tenderness. Some dentists and patients may naturally become frustrated when these areas of pain are not improving over time. Even if you have had physical therapy, massage, chiropractic, osteopathic treatment, etc for these areas of concern and they are not improving then you may want to reconsider why other TMD patients who have had similar problems and pain sites improved with GNM occlusal treatment. “Don’t let dentists take away your bite! It’s yours, protect and guard it! Because it could be your life.